I recently read this top 10 list from a small business group that focuses on getting people moving in growing their own companies. I thought most of these were also useful for people in the nonprofit community. As an org grows it can be easy to get caught up in activities that are quite peripheral to your work. Keep focused on the mission and your objectives. - I will be the MC so come by and say hello! and on this site you can find out about the ratings given to countries on their investment in education - hence children and the future. Japan, the US and Italy all got D's. ... check it out. - any one can get their message out if they are creative. Went to a meeting filled with interesting people last night - many doing similar or related work. Many trying to bridge the gaps between Japanese and non-Japanese activists. Hopefully we will get something together in terms of centralising events and program listing and then maybe later address the issue of how to get more articles and info without the conservative slant to people that want to be more active. A fellow SIPA grad is currently being sued by a huge company about something he supposedly said in an interview. there will be a party this Sunday April 22 from 8pm. 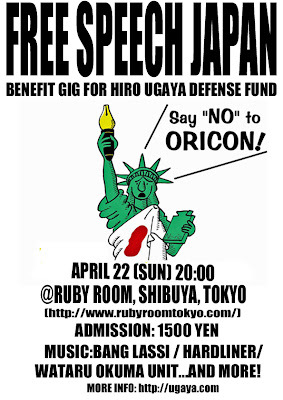 I have heard good things about the bands but more importantly - it is probably just a good chance to find out more about what is going on and what freedom of speech really means here in Japan. Find out more and take a stand. Went to an opening last night of photos related to al lthe rights listing in the UDHR (universal declaration for human rights) it was very interesting and really worth seeing. the only thing was - most people were important embasssy and MoFA staffers - a few NGO people - wish there had been more. 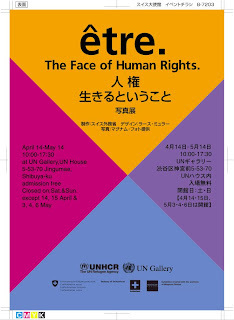 Definitely worth a visit - here - more unhcr event info - here. I had to say hello to sadako ogata - i think she is just great and very inspiring. I did not want to trouble her - so many people were waiting just for meishi kokan - but i thought it was more meaningful to just tell here thank you for your hard work you are truly inspiring to all women. Happy to annnouce that i will be working in a new training program - this time aimed at people who want to work in international organizations not just NGOs. Yes - i probably did not ask for enough money - but hey we need to get the program off the ground first. Get more info on the courses ... here. we will have an opne house/setsumei kai on the evening of Th April 26 ... meet the faculty and see the course materials. should be fun. Still need to work out the fact that - No i can not teach in Japanese - and the course materials are high level English. someone asked me last week --- so did the Japanese change article 9? i was surprised - i did not know what was going on. i have done a bit a research and was happy to say no it had not changed without our noticing. there is so much to see and pay attention to and to study to get a better understanding ... just have to keep it all perspective. can not do it all or feel guilty about what we missed.